Paseo Merchants Partner with Fertile Ground to Recycle! The grass is greener in Oklahoma City! And the Paseo Arts District, Oklahoma City’s Unique Arts Destination, is helping OKC shine a more vibrant shade of green. Paseo merchants are expanding their partnership with Fertile Ground, a local composting and recycling service, to create a cleaner, more sustainable Oklahoma City. Fertile Ground is a worker-owned cooperative that offers commercial and residential composting and recycling pickup services, emission-free lawn care, and zero waste events in the Oklahoma City area. “The mission of Fertile Ground is to help local businesses with their green image and make our state a more beautiful and sustainable place to live,” said Courtney Hurst, Zero Waste Specialist at Fertile Ground. All the recycling and compost picked up in the Oklahoma City area stays there! Since 2014, the Paseo has partnered with Fertile Ground during the annual Paseo Arts Festival. The Paseo Arts Festival was one of the first in Oklahoma City to create a festival-wide recycling program. 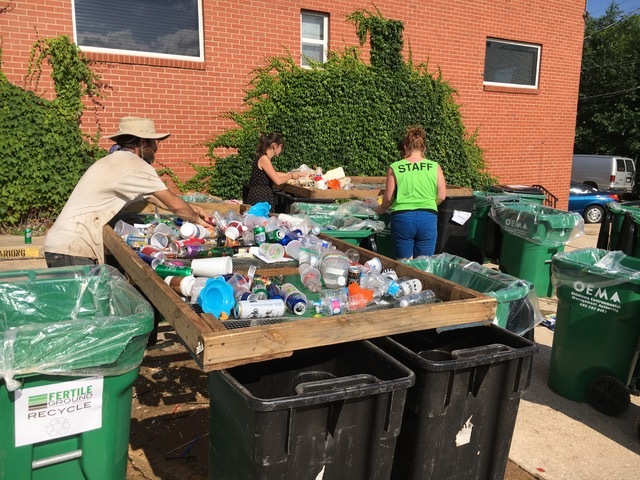 Fertile Ground works with the Paseo to ensure that the festival maintains a waste stream that is at least 75 percent recyclable. Today, many Paseo businesses continue to work with Fertile Ground. Due to receiving a high volume of merchandise shipments, Paseo merchants accumulate large quantities of cardboard and other recyclable materials. In the past, merchants were forced to take their recycling home and were left without a way to recycle cardboard. Now, rather than paying the city to bury their cardboard and other recyclable materials in a landfill, the merchants utilize Fertile Ground’s services on a weekly basis. The Paseo, characterized by its colorful art and architecture, just got greener!